for all my pains and labour. would be yours, and so is the heart. In most of the letters, he signs them H.R. What did the r stand for? I searched for a possible last name but all I found was Henry Tudor. The R stands for Rex, the Latin word for King. Kings use Rex and Queens use Regina, hence Elizabeth R or Elizabeth Regina. Thank you so much! I love the website by the way. It blows my mind how Henry can go from being so in love with Anne Boleyn, asking for reassurances and almost seeming a little insecure with the way she feels about him to hating her and wanting to get rid of her and remarry! I know he hated writing and he wrote all those letters. I wonder throughout the rest of his remaining years if he ever regretted it or was saddened by it.I know he never spoke of her. Nuts! I think it is more than a little scary that Henry could express such loving thoughts to Anne, and then ‘turn’ on her so completely. Seeing how his emotions could change so thoroughly, I doubt he regretted or was saddened by what he did (or caused to happen) to Anne. Henry always was terribly black-and-white in his thinking, though. While he was a true romantic, I think this was because he raised up the woman he loved to be almost goddess-like – the most perfect, the most beautiful, the one who could make him truly and completely happy. Of course, the issue with this is that all of us are human and imperfect, including Anne Boleyn and each of Henry’s other wives. And when he realised this, his black-and-white view of things turned the beauteous angel of his dreams into an utter disappointment and (in his mind) someone who had tricked him into believing she was The Perfect One. In short, I think Henry wanted something that doesn’t exist – the pefect woman. When he couldn’t get that, he threw a tantrum and blamed the woman herself…with devastating consequences. Of course, this was compounded by his consuming need for an heir – and he always blamed the woman for failing to produce that, too. Henry VIII may have seemed mad during his latter times. I have read endlessly and watched documents. The wretched ulcers he suffered, which were horrid, couldn’t have helped his moods much, probably inflamed them. He had the ulcers cut and drained of pus, almost on a daily basis, just to keep him conscious. 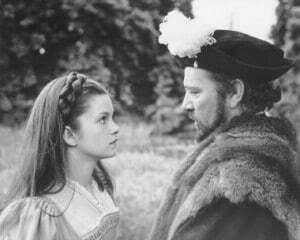 What I wonder is, why did he believe Cromwell whom he charged to carry out the investigation on Anne Boleyn? How come he never suspected her of being set up. Surely he must have been of known and expected there to be enemies within the palace as the norm, or was it that he had given up on her having a male heir to the throne? I think it was because in part he wanted to be rid of her…i feel like Anne and Henry ‘s relationship had become the love and hate one. So in part he wanted to be rid of her, because she drove him mad with inability to produce an heir. Plus she was flirtatious..perhaps he witnessed her flirtations to some extent….combined with inability to produce a boy…i think he really started to believe that she was wicked…..like a man eater so to speak that is after a man’s heart and seeks control………and then the “evidence” one on top of the other conveniently layered on….and because there were more and more people against her not just Cromwek…it all just came together and formed a “perfect storm” of events…….. So to him there was no point turning back..because too many people hate her….she cant give him a son and he got sick of being led by a woman……..I think his understanding to failed pregnancies was due to her having affairs and being corrupt all together….Because in their times…..the belief was…”if you cannot produce an heir..something is wrong with you” Nonetheless i must say this is all happened because it needed to happen…Anne did not die in pain…in fact most of her pain came during her life….so why worry over it nw…she is in a perfect place and her and Henry soul chose a perfect path and lessons to learn from each other. Once we cross over we lose all ego and become angelic beings…..not kings..queens servants. Trust that they are al l in a greater place now and probably walking among st us…. is this the comic relief? Yea verily, i know not whether to laugh or cry. I really love this website. I am very interested in things like this. I love to read and watch movies about this. I sometimes ponder on Henry and Anne. In some of his letters it seems that he feels ignored or unloved in return. And I wonder if this was indeed the case. Instead of Anne teasing him or seducing him or playing some clever sly game as is sometimes the belief Perhaps she in fact did not care for his attention initially? Perhaps her observations of his treatment of her sister and also of his wife, did not appeal to her. Perhaps that is why she withheld herself from him for so long. Perhaps her instincts told her not to trust him? We’ll never know and of course history treats the loser unfairly… no real portraits of Anne remain(who would display or keep them, knowing how vicious Henry would be?) Several unkind, even bizarre descriptions of her lack of looks and charm- obviously ridiculous as England was changed because of Henry’s obsession for her, she must have had a lot more going for her than the several anti- Anne descriptions that are too often presented as facts. I think you’re right on the money here. Although it’s said she didn’t hold much for her sister she surely saw what had become of her at his hands and most likely had the typical disdain a woman does for lecherous men. I mean, he had just discarded her sister like trash hardly a year before, and could’ve appeared to be going for sloppy seconds. Mary had birthed him a son, surely her sister was capable! There are many factors here but genuine love isn’t one of them. I believe genuine love is the ONLY thing that WAS there. It was everything else that was wrong. Love was not enough. I like the way you think. But maybe someone close to the king convinced him to change his mind?? He was also cheating on Anne and she’d have to be blind to not notice that. It’s possible that Annes pressuring and the facts you stated may have added up to her death. Jane Seymore also couldn’t have liked Anne so she could’ve contributed to her death. Anne wasn’t the nicest to mary either. She had too many enemies and not enough friends to last too long anyways.